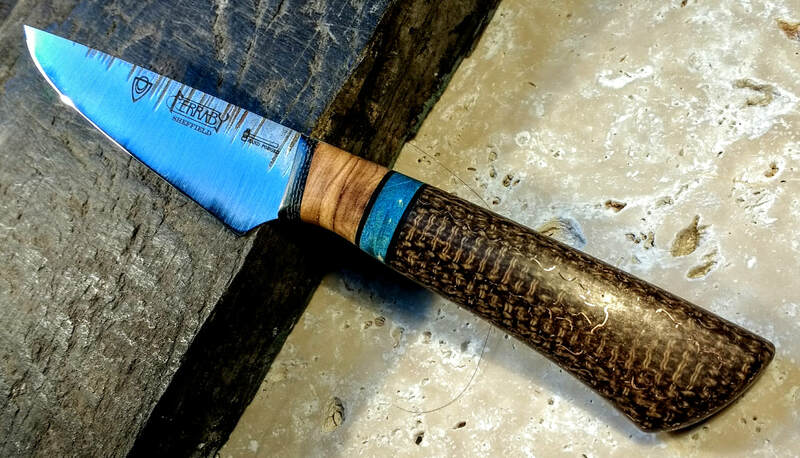 I make handmade kitchen knives in my workshop in Sheffield, England. My values are in every knife I make. I believe in slow living, in taking time to do things properly, in reusing, recycling, and having the least impact possible on the earth. My aim is to make world class kitchen knives that are pieces of art as well as practical tools that will last for generations. 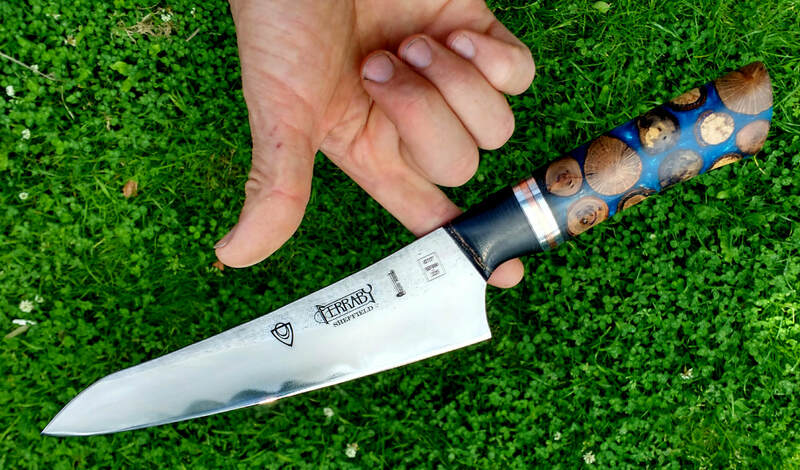 Every knife has its own unique custom art handle and some of the handles take months to make. I use a lot of up-cycled materials in my handles, things that would have gone to the scrap heap but can be given a new life and purpose. I get inspiration from all around me and I’ve used clock cogs, climbing rope, copper pipe from a truck and metal from old factories. I also use natural materials such as shell, bone and I've even used Star Anise. Much of the wood I use is reclaimed and all of it is ethical. I only use wood from trees that are not endangered and not from areas of deforestation. 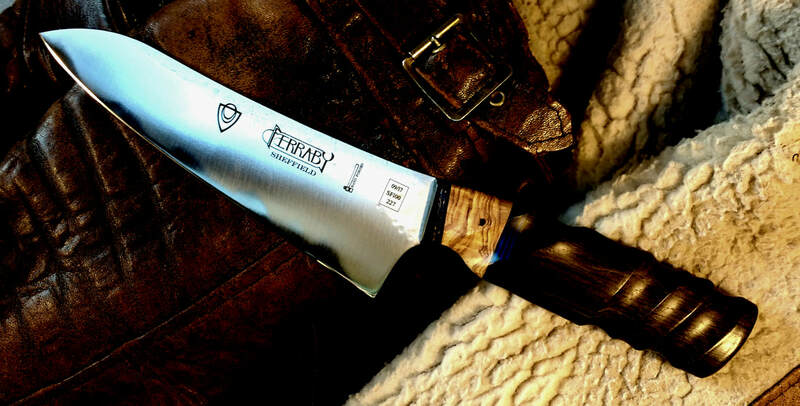 As an environmentalist it is extremely important to me that the knives are sustainable and ethical. I use some of the last pieces of razor blade steel that was made during the steel industry heyday in Sheffield. The steel is called Silver Fox 100 and is named after one of the famous Sheffield Knife Industrialists Samuel Fox who had a silver streak in his hair. It's a high carbon stainless steel which combines the sharpness of carbon with the rust resistant qualities of stainless to give a super sharp lasting edge. My knives are hardened by Greensmiths of Sheffield. They are experts at hardening steels and have some state of the art kit, including a cryoquench which uses liquid nitrogen to plunge the blades to -80C. This makes the metal particles change their structure and shrink. This allows a very sharp, brittle edge. The steel must then be tempered to give it flexibility. The temperature for hardening is usually high - glows red or orange. The temperature for tempering is much lower - a straw brown - and stays there for longer. The best edge stays sharpest for longest. Hardness is measured using a high pressure diamond pressing into the steel. This is the Rockwell C test. 59 is optimum for a knife, 60 and above gives a very hard edge but is more prone to chipping and is hard to sharpen. Below 59 it gets blunt fast. The profile and edge geometry of a blade are very important. The angles must be just perfect so that the edge is not only sharp but also strong. This allows maximum strength and a smooth cut without bevels which create friction. Each blade has its own special marks and there are some hidden marks which have a story behind them - see if you can spot them! Each month I put a small selection of handmade kitchen knives up for sale on my shop page, the blade sizes depend on what I have finished and the handles depend on what has inspired me that month! You can see examples of previous knives in my gallery.